Anberlin is an American alternative rock band from Winter Haven, Florida, formed in 2002. Since the beginning of 2007, the band has comprised lead vocalist Stephen Christian, bassist Deon Rexroat, lead guitarist Joseph Milligan, drummer Nathan Young and rhythm guitarist Christian McAlhaney. Members of Anberlin originally formed a band under the name SaGoh 24/7 in the late 1990s, releasing two studio albums before having a change in musical direction and name. Anberlin was formed in 2002, within a year of forming they had signed with semi-independent record label Tooth & Nail Records and released their debut album, Blueprints for the Black Market. In 2005, the band released their second album, Never Take Friendship Personal, selling in excess of 150,000 copies. Anberlin continued its rise to prominence whilst enjoying a loyal MySpace following and averaging well over 200 live shows per year. The band's third album was released in 2007, Cities became their first album to reach the top 20 of the Billboard 200, selling 34,000 copies in its debut week. After three studio albums and five years with Tooth & Nail Records, Anberlin announced their signing with major label Universal Republic Records in August 2007. The band's first album on the major label was released in 2008, entitled New Surrender. The album peaked at number 13 on the Billboard 200, with the first single, "Feel Good Drag", claiming number one on the Hot Modern Rock Tracks chart, after 29 weeks in the chart. 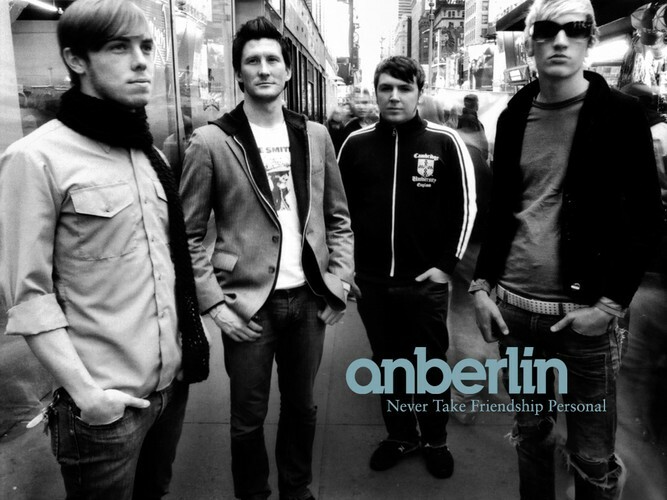 Prior to the release of their fourth studio album, Anberlin had sold over 400,000 albums.